Jobs for Life grew from a friendship between a businessman and a pastor into an international organization, with a training method and curriculum now offered through churches, rescue missions and community centers in 275 cities and nine countries. Jobs for Life started when two men came together. One needed drivers for his trucks; the other needed jobs for his community. “It did more than we thought it would do,” says the Rev. 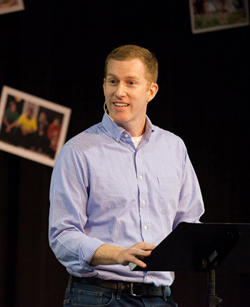 Donald L. McCoy, pastor of the Pleasant Hill United Church of Christ in Fuquay-Varina, N.C., and co-founder of the organization, which trains men and women to be better employees and find meaningful work. The two men became friends when McCoy called Raleigh construction executive Chris Mangum to get an estimate for paving his church’s parking lot. The men -- one black, one white -- soon began recruiting others to make up a partnership of businesses and churches with a common mission: helping their unemployed and underemployed neighbors. Originally called Jobs Partnership of Raleigh when it was founded in 1996, Jobs for Life has grown into an international organization, with a training method and curriculum now offered through churches, rescue missions and community centers in 275 cities and nine countries. bill to finding a job. From 1996 to 2005, about 350 people per year went through the program. 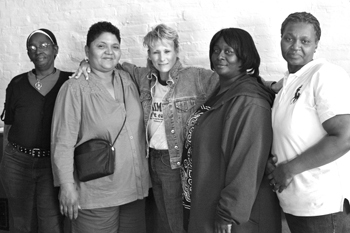 From 2006 to 2013, Jobs for Life graduated 19,200 men and women who were able to find jobs. Jobs for Life is supported financially by private individuals, companies, churches and foundations. About 20 percent of its budget comes from the sales of training and materials. The program made a decision not to require a fee for an employer to hire a graduate. While Jobs for Life has been successful in preparing men and women for work, the impact can’t be measured by numbers alone. Sometimes the journey to employment may be two steps forward, one step back. “We’re in it for the long haul; it’s important for people to understand it’s a marathon, not a sprint,” says David Spickard, the president and CEO of Jobs for Life. McCoy, a chemist, had a background as a civil rights advocate. Mangum -- who died in 2013 -- was in the midst of a journey to change himself and his company. Early on, they made the Rev. Skip Long, a charismatic faith leader, the first executive director of what was originally a local organization to mentor, train and employ some of Raleigh’s neediest citizens. The Rev. John Bender, formerly of the Raleigh Mennonite Church, recalls that McCoy and Mangum shared their dreams and visions of helping their larger community. “Businesses were booming, but some needed workers,” he said. A number of churches, especially those in the African-American communities, knew of church members or people in their communities that were unemployed or underemployed. The new team began recruiting church and business leaders to partner together. Quickly, though, they ran into issues of class and race. One of the businessmen pointed out that it was important for both businessmen and pastors to reflect the community; it wouldn’t work if all the businesses were represented by whites and all the churches by blacks. The mandate was, “We need to balance this table, or I’m out,” Long said. So Long, Mangum and McCoy called more people to the circle and rounded out the mix. “We avoided some bumps in the road around the issues of race and power, because we had some great men and women around. They were willing to be vulnerable, to be learners and sincerely engaged in these relationships,” Long said. At first, Long was working 40-hour weeks without pay, living off his savings. But Mangum and McCoy realized that he needed a salary and asked each church and business to make monthly contributions toward his support. What had started out as helping a few men and women get jobs kept growing. Long spent his days coordinating job openings from employers with job requests from pastors, and his evenings running the classes. He carved out time to travel around the country looking for job partnership models. At Dr. Tony Evans’ Oak Cliff Bible Fellowship in Dallas, Texas, he found a job training program. “I read the curriculum with great interest,” said Merl Mangum, Chris Mangum’s brother, who worked in the family business. He and Long set about tweaking Evans’ guidebook. “We made some minor changes and added a chapter. It became the basic curriculum,” he said. The program combined traditional job-seeking skills such as resume writing with Bible stories that could be applied in the context of the workplace. Participants attended 12 weeks of training, meeting two nights a week for two-hour sessions. They studied biblical principles that would help them understand how to operate within the marketplace. “We called it a curriculum because we were dealing with the workplace, but it was Bible study,” Long said. Teachers and job seekers talked about the biblical principles of relationships, as well as attitudes about integrity, time management and excellence. Participants were taught how to apply those principles to attaining a job, including how to prepare a resume, select proper attire and act in the workplace. Some of the participants had had trouble in the past retaining jobs. Mentors from the church and businesses taught them how to deal with conflict, so that instead of walking away from a problem they could work through it. Debbie Edwards became the first hire from the program. Jim Anthony, the managing director of Colliers International in Raleigh, was at the first organizational luncheon and announced during that event that he had an opening. Edwards was between jobs at the time. “It was a cold and rainy night, and the pastor and I pulled in the church parking lot at the same time. He passed on the job information. I was hired in two or three days,” she said. “We hired her before the program,” Anthony said. “The program just reinforced her capabilities. She had a profound faith and trust in God. She is sincere and real personal, no fluff and no pretense. She was very direct about who she is,” he said. Jobs for Life participants come from all walks of life. Alonzo Hughes, 45, of Franklin, Tenn., graduated from the program two years ago. He had spent time in jail for selling cocaine. “I was struggling to find a job, trying to make ends meet the best way I could,” he said. After his release, he visited a church one Sunday and heard about the program. “I decided to give it a try. I learned how to present myself during an interview, how to be honest on the application.” He is now a cook and kitchen manager for a restaurant. He continues to talk almost daily to his mentors, who are helping him navigate through his life. “I am still learning,” he said. 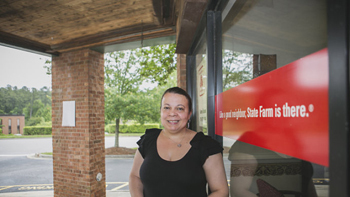 The Raleigh program’s success in putting people to work made an impact. The first Jobs Partnership class was hosted by Building Together Ministry, a neighborhood nonprofit that helped neighbors assist each other in after-school tutoring. 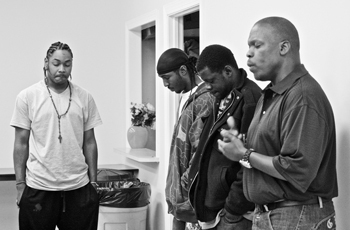 It was held at Halifax Court, a public housing community in Raleigh. In 1997, Jobs Partnership grabbed headlines as President Bill Clinton invited Chris Mangum, as part of a group of 100 of the nation’s most prominent business leaders, to help him with his welfare-to-work initiative. He wanted to hear from leaders such as Mangum who had partnered with churches to make an impact in helping residents find lasting employment. Mangum invited Long to join him, saying, “You are coming with me. We do this work together. You are going to meet the president,” Long said. “In Chris’s biggest moment, he thought about me. That has stuck with me,” Long said. Once other business leaders heard about the program, they were interested in bringing it to their communities. At that time, Long said, the organization’s leaders were torn. He and Mangum were committed to spreading the word around the country and assisting other communities. “But the leadership in Raleigh didn’t care [so much] about the work going on in Mississippi,” he said. So they kept the Jobs Partnership of Raleigh as it was and formed the National Jobs Partnership alongside it. The Raleigh office had its own leadership and board as well as the national one. Mangum and Long traveled to Washington, D.C., and Orlando, Fla., to organize the sites there. Long continued to spread the gospel that “dignity comes with a job.” In 1999, he attracted ministers from all over the country intent on replicating the program when he spoke at a Washington, D.C., conference on the growing role of church-based charities in delivering social services. Long established relationships with some of the country’s top CEOs, who were interested in bringing Jobs Partnership to their urban communities. “We were able to share our story. We picked up a lot of steam,” he said. As the organization changed, so did its name. Jobs Partnership of Raleigh became the National Jobs Partnership as it expanded across the country, and by 2006, the nonprofit became Jobs for Life. Paul N. Bloom, a senior fellow with the Center for the Advancement of Social Entrepreneurship (CASE) at Duke University’s Fuqua School of Business, said organizations need to focus on key capabilities to make a sizeable impact. In his book “Scaling Your Social Venture: Becoming an Impact Entrepreneur,” Bloom summarizes what he has learned from this research. He uses the acronym SCALERS -- staffing, communicating, alliance building, lobbying, earnings generation, replicating and stimulating market forces. Jobs for Life uses a lot of those key components, Bloom said, such as sharing their story, relationship building and getting good paid staff as well as volunteers, including retired businessmen, to serve as mentors. In 2005, Rick and Suzanne Flammer, based in Washington County, Texas, helped expand the program into South Africa. The Flammers took the Jobs for Life youth program called “Powered for Life” to the Dunamis Christian School in Welkom, South Africa. Welkom is a gold-mining town, 100 miles south of Johannesburg. The curriculum uses interactive videos, on-site visits and role playing to help youth ages 16 to 20 learn about careers. As is the practice at all Jobs for Life sites, the Flammers interact with local business leaders to see what skills employers are looking for. “We try to help people create careers and jobs,” Rick Flammer said. As the organization has grown, its leaders have refined the model. The training is now 16 sessions, twice a week for eight weeks. The curriculum has been updated as well. David Spickard, the current president/CEO, gathered a group of leaders led by a board member to revise it, integrating more explicitly the human resources and biblical components of the program. But “core character traits of attitude, integrity, respecting authority and how to handle conflict -- all of those elements remained the same,” Spickard said. The organization also continues to maintain that job training should be a priority for churches. From the beginning, Spickard said, they had to deal with heart issues -- the things inside people that tear at their value, their purpose, their understanding of who they are, their way of respecting authority. “The training had to go far beyond a resume or how you dress. It had to get at their motivation, their identity,” he said. One of the lessons Spickard has learned along the way is that participants often see the discipline of completing the program and realizing their life’s purpose as the real prize. Finding work is a bonus. “More than half of what we do in training is simply encouragement,” he said. Spickard’s hope is that one day Jobs for Life will not be needed. But that time is not here yet. In its earliest days, the organization was driven by charismatic leadership from Long and Mangum. Today, Spickard also draws on his MBA to manage the organization into the future. He uses the toolkit and online resources to replicate the Jobs for Life success. He’s using social media to continue to tell the story of dignity restored, lives changed and communities transformed. The core principle that Mangum and McCoy put in place almost 20 years ago has stood the test of time: help thy neighbor. What does your church or organization need? What resources and gifts does it have that others need? Who are likely partners whose needs and gifts mirror your own? Why was “balancing the table” a critical step in the early stages of Jobs for Life? What does the phrase mean for your organization? What would you be willing to give up to help do that? What role does vulnerability and a willingness to learn play in growing an organization? What are the “heart issues” that underlie the work that your church or organization wants to do? Jobs for Life was built upon relationships. What key relationships in your life and work offer the possibility of fruitful and mutually beneficial work together?